Creflo Dollar and Eddie Long in touble…..Investigated for Fraud ! Not many people are talking about this but this is big news. November 06, 2007. WASHINGTON (AP)- The top Republican on the Senate Finance Committee said Tuesday he has launched an investigation into alleged financial wrongdoing involving six well-known televangelists — including two based in Georgia. Senator Chuck Grassley of Iowa sent letters to six Christian media ministries this week requesting information about their expenses, executive compensation and amenities given to executives. Among them are Bishop Eddie Long of New Birth Missionary Baptist Church in Lithonia and Creflo Dollar Ministries of College Park. Grassley said he is following up on complaints from the public and news coverage. He said the allegations involve governing boards that aren’t independent and allow generous salaries and housing allowances and amenities such as private jets and Rolls Royces. Also named by Grassley as targets of the investigation are Paula White Ministries of Tampa, Florida; Benny Hinn Ministries of Grapevine, Texas; Joyce Meyer Ministries of Fenton, Missouri; and Kenneth Copeland Ministries of Newark, Texas. I hear that people just have a problem with Mr. Dollar is because he is RICH… not well to do .. RICH ..and people dont like that …. Is this a problem? We are not Judgeing , just looking for educational dialouge. 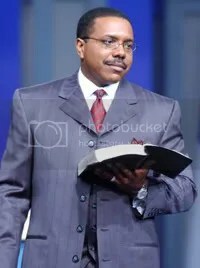 You are currently browsing the archives for the Creflo Dollar category.